Be the first to share your favorite memory, photo or story of Erika. This memorial page is dedicated for family, friends and future generations to celebrate the life of their loved one. 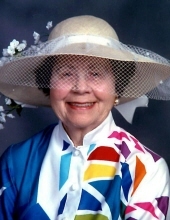 Erika Smith age 92 of Midland, Michigan passed away peacefully on January 15, 2019. Erika was born in Offenburg, Germany. Her family then moved to Pforzheim, Germany where at the end of WWII she met and fell in love with H.O. Smith, a very handsome American soldier. They were married in Pasadena, California on March 29, 1947 and she proudly became an American citizen shortly thereafter. They were married for 71 years. Erika is survived by her son Steve M. Smith (Theresa) of Grand Rapids, MI, her grandchildren Melanie, Nichole, David and Kyle and five wonderful great grandchildren. She was preceded in death by her husband Hermes and her beloved daughter Heidi Nelson. Erika loved the Midland community and the many friends she had that were always there to provide love, friendship and kindness. She greeted everyone with a warm smile and a friendly “hello”. The family would like to thank the staff of Stratford Pines for their care and support and their many “hello Erika” which brightened her days. Per her wishes a cremation memorial service for Erika will be held at 1 p.m. on Saturday, February 2, 2019 at Memorial Presbyterian Church. Her family will receive friends at the church on Saturday from 12 p.m. noon until the time of service. In lieu of flowers please consider a donation to the Chippewa Nature Center or Midland Center for the Arts. To plant a tree in memory of Erika Smith, please visit our Tribute Store. "Email Address" would like to share the life celebration of Erika Smith. Click on the "link" to go to share a favorite memory or leave a condolence message for the family.